There are generally no set rules of what type of vehicle that will be suitable for use on your vending business, any type of vehicle can be used. You have the freedom to choose what type of vehicle to service your vending machine locations. According to my experience when i started out on my vending business i have some inisights on what the customers perspective on my vending business on what type of vehicle that i have used. 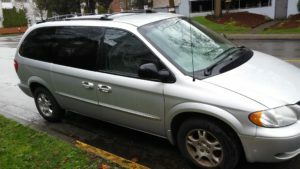 If you have around 5 to 10 locations for starters then a sedan or a family van would be enough such as the dodge caravan, i used a dodge caravan for a long time with 300,000+kms in it and there are no problems, just the charging of gas for the A/C then i switched to a Ford E250 which has around 190,000+kms because i had around 30 locations during that time. My problem with high mileage vehicles is they would have new problems suddenly and breaks down, the Ford E250 had several problems, fuel filter, ignition system, front rods and before i sold it the van was hesitating when im applying the gasoline. This caused me several repairs and it is not worth to keep it and finally sold it. Recently i got a 2015 Ford T1-50 Transit which didn’t give me any problems and issues and it can handle even 15 locations without any problems. So i use it everyday at least on 8 to 15 locations from Monday to Saturday with a one day break during the weekday. 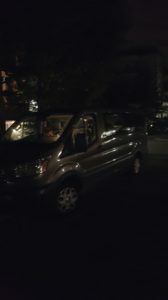 The only problem using a very old cargo van when you are servicing the locations is that the impression at you is not very good since most people tend to associate capable person with a nice cargo van at is up to date, i don’t have to ask the people since i can feel it inside me. When i had the 2015 Ford T-150 Transit, all the locations i go to has no issues dealing with me and i always recieve a lot of compliments. Today in the era of retail and service, you have to have a nice presentation on what you drive and what you wear when servicing the locations. 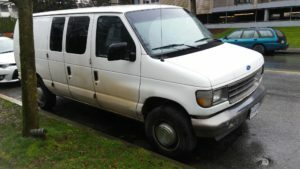 I never had problems when im using the 2015 Van, but prior to that 1 had about 2 locations was lost maybe because im driving a beat up Ford E250? I truly wish that the people don’t look at your business by face value and what you drive. The vehicle that you will be using for your vending business must be at least presentable and pleseant to your customers since some people judge you on first impression and we would like customers to see you in a very professional way. It’s sad but that’s the way it works on most cases even in the Philippines or generally in Asia which i have dealt in Hong Kong, Taiwan, Singapore, Mainland China Shenzhen Guangzhou Shanghai, Malaysia. Way back in the Philippines when my business growing pains is that i have to drive scooters and motorcycles for about 7 years to 8 years and i never touch a car during that time when i was rebuilding my business, its only during the weekends that i use my car. The reason that i use a motorcyle back then because i deal mainly in computer memory chips and most customers are in a hurry to get the parts for finally assembly on the desktop orders from customers. I love scooters and big bike motorcycles way back then in the Philippines, i had taiwanese, italian and japanese with almost all kinds and shapes and used it until it breaks down. Even used a motorcycle to travel 8 hours just to reach a destination for a customer! From Manila to Dagupan! It was dangerous and stupid for me to ride in 2 wheels but i have to make a living right? i have to make a sale! I have exhausted all sales in the city and have to move and find it somewhere! Back then there was a boom in the PC Computer during the mid 1990’s and people are always hungry for memory chips, you name it i have it. All the memory chips back then during the 1990’s was with warranty sticker by ‘One Touch Trading’ as my company name, i was the top 5 computer memory chips supplier back then where i order the raw chips from Hong Kong and Taiwan on a weekly basis! around 200 to 500 pieces along with the other supplies like Seagate Hard Drives coming all the from USA it was 40GB. I can tell you countless hours on my journey as an entrepreneur, even had a store in Singapore at SIM LIM Square and was a Permanent Resident status doing business there, but that will be another story maybe will be on another website.